Turquoise and amber - one of my favorite color combinations - blend beautifully in this Southwestern themed lampwork necklace and earring ensemble. Sprinkled with fine silver and then "aged", Lora McLaughlin's wonderful beads have a delightful earthy appeal that's so hot right now! 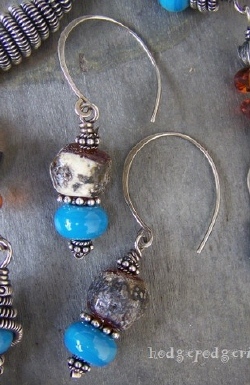 These unique lampwork beads are a perfect complement to the funky wirework! 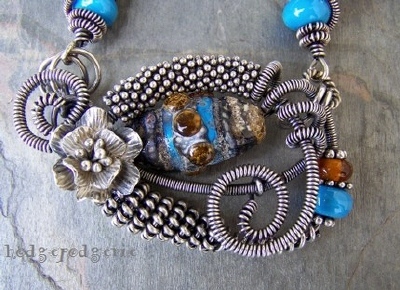 The focal is made of Sterling silver wire with a Thai Hill Tribe silver flower and Lora's lampwork. Matching lampwork and lots of coiled wire create the necklace section. 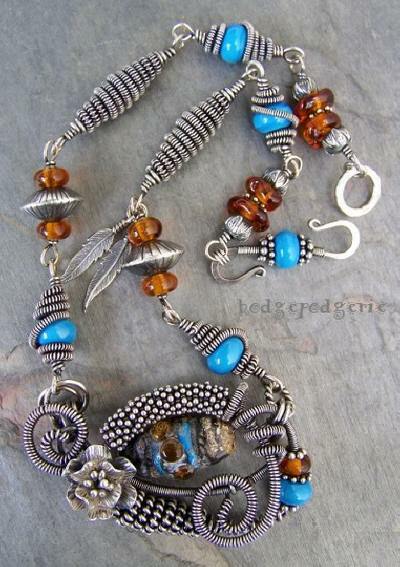 Hill Tribe beads and Sterling silver feathers enhance the necklace's Southwestern feel. For a finishing touch, the entire piece has been given a gentle rich patina. This 100% handcrafted Sterling silver and lampwork necklace is a comfortable 20 inches in length. The matching earrings, with their handmade 18 gauge Sterling silver ear wires, are 2 inches long. Return from "Native Dance Necklace" page to "Necklace Gallery" page.